On a world full of bright lights and glamorous casinos, Club Vertica was quick to establish itself as an exclusive experience. Run by a mysterious wealthy backer, Club Vertica strictly monitored admittance for its first several years. As a rule, only the wealthiest, best-dressed and most beautiful patrons were allowed entrance; exceptions were made only as they suited the fancy of Club Vertica's owner. Recently, the restrictions were loosened, sparking rumors that Club Vertica had been sold. Still, much of its old reputation remains; if you want to seem important on Nar Shaddaa, you talk about going to Club Vertica. Although individuals from many planets and species live in the Corellian Sector, it's humans of Corellian descent who made the area what it is today: a pro-Republic criminal's paradise. There is no cargo that can't be offloaded here and no job so dirty that someone won't take it. The families of migrant workers live alongside grizzled Republic veterans who settled on Nar Shaddaa to retire in style, happily turning a blind eye to the darker activities around them. Over the past decade, the gangs and pirates of the Corellian Sector have become overshadowed by the presence of the Exchange. Once a group mentioned primarily in HoloNet information crime reports, the Exchange crime syndicate has found an army of able recruits on Nar Shaddaa willing to back its slicers and spice-refiners with muscle--much to the dismay of the Hutt Cartel. The glitz and glamour of Nar Shaddaa hides an uglier side. One of the poorest sectors on Nar Shaddaa, the Duros Sector hosts men and women who've been exploited and left behind--refugees of war and casualties of the immense wealth hoarded by Nar Shaddaa's Hutt masters. The peoples of the Duros Sector--the majority Duros, but with a mixed minority of Evocii and other alien species--have watched Nar Shaddaa's wealth grow and seen none of it for themselves. Some have lived in the sector for generations, while others are recent immigrants desperate for any work they can find. The residents' unrest has been stirred by charismatic leaders in the past, from Jedi Masters to would-be warlords. Factories and corporate offices cover much of Nar Shaddaa's surface, and the Lower Industrial Sector houses some of the oldest industrial facilities and warehouses still in use--some dating back hundreds of years to the Evocii's construction of the city. But layers of rust haven't prevented new tenants from making use of these resources. The Empire operates a series of front corporations out of Nar Shaddaa, concentrated in the lower levels. These companies are used to provide experimental weaponry and technologies to the Empire at a discount rate, facilitate the slave trade that fuels Imperial labor across the galaxy, and serve as a clearinghouse for cargo, credits and individuals being moved through non-Imperial space. The Hutt Cartel also maintains an interest in the sector --buildings not leased to the Empire store spice, adrenals and implants. The warehouses are heavily guarded, and some are rumored to hide the special projects of individual Hutts from their rivals. As the technological heart of the galaxy, Nar Shaddaa is home to Network Access, a vital HoloNet hub that governs all HoloNet operations on Nar Shaddaa and much of Hutt Space. Billions of transactions and communications are processed each second by Network Access computer systems, ensuring the proper functioning of communications throughout the sector. Boasting the galaxy's most state-of-the-art security protocols, Network Access is the ultimate challenge for enterprising slicers. The wealthy and powerful pay good money for information pirates to break into Network Access and recover data, redirect communications or simply "tweak" the truth. As one of the most heavily guarded places on Nar Shaddaa, anyone who manages to infiltrate Network Access's inner workings earns the status of legend. Nar Shaddaa has ever been an attractive world for Nikto enforcers seeking employment with the Hutt Cartel. The Nikto Sector, as it is now known, began as a place where Nikto warriors came to attract the attention of prospective employers, but the sector was formally bequeathed to the Nikto Horoth Gendi by his Hutt master when he saved the Hutt's life and business in an act of quick-thinking bloodshed. Horoth Gendi used the opportunity to found his own gang and free himself from servitude to higher powers. Since that time, the Nikto Sector has fallen under the control of a succession of Nikto gangs seeking a bigger piece of Nar Shaddaa's underworld business--the latest of these gangs being the formidable Kintan Kings. For this year's proven, high-quality implants and neuro-stim technology, visitors to Nar Shaddaa go to the Promenade. For next year's innovations, they go to the Red Light Sector. The bodily enhancements available in the Red Light Sector are almost uniformly illegal, untested, highly dangerous or all three. Athletes looking for an undetectable edge, opportunistic gang members and adrenaline junkies alike all come in search of the new and death-defying. Some of the technologies sold in the Red Light shops eventually make it to market in legitimate form, while others become staples of the high-risk, high-reward underground implant scene. Alongside the surgical and bioenhancement shops, other shady businesses preying on sentient appetites tend to bloom. In particular, slavers and spice dealers often offer products here, taking advantage of Red Light Sector customers' wealth, desperation or moral flexibility, as appropriate. 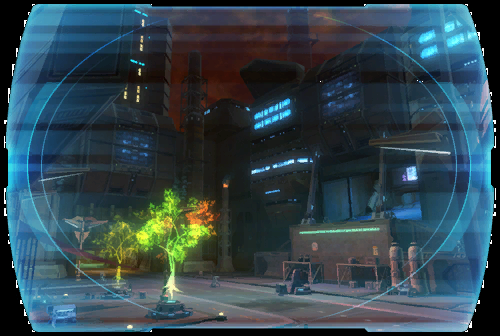 The Upper Industrial Sector is the center of manufacturing and industry for Republic corporations on Nar Shaddaa. Here, centuries-old droid construction facilities stand next to the cluttered offices of startup firms desperate for resources and space. The companies share a common need for heavy security and compete for similar clientele, ensuring that this sector remains a choice location--but are otherwise wholly independent. For a corporation headquartered in Republic space, Nar Shaddaa is a convenient place to develop technologies restricted by Republic laws--or from which to deal with foreign parties. The Senate frowns on these activities, but just as often turns a blind eye when these same corporations bring their innovations back to Republic worlds. At first glance, Shadow Town resembles an ordinary Nar Shaddaa slum. Its population makes it unique. Rather than housing underworld gangs or powerful Hutts, Shadow Town is home to imprisoned individuals who were once useful to the Empire and who may be useful still--scientists, assassins and genetic experiments too valuable to kill and too dangerous to release. Cranial implants designed to explode upon leaving Shadow Town's borders are implanted in prisoners' heads. Secondary prisons manned by Imperial personnel store prisoners who must be kept docile. Many residents of Shadow Town make the best of their early, forced retirement, cooperating with Imperial authorities and living relatively "ordinary" lives... but nearly all would flee, given an opportunity. The Empire pays the Hutt Cartel a considerable sum to keep Shadow Town running. For the Hutts, the risk of keeping prisoners even the Empire doesn't want inside its borders is offset by the considerable rewards. The Star Cluster Casino certainly wasn't the first casino to be built on Nar Shaddaa, but every casino since has tried to match its sleek design, pulsing lights and various entertainment options. The Star Cluster was the first to debut live dancers, the first to feature sabacc and the first to hire scantily clad girls as waitresses. Owned by a conglomerate of Nar Shaddaa industrialists (including Czerka Corporation executive Yem Leksende), the Star Cluster Casino is an attraction for tourists and weary working stiffs alike. Some have derided it as just another way in which the rich steal from the poor on Nar Shaddaa, but that hasn't stopped business from booming. The Promenade is Nar Shaddaa at its most lavish and inviting. Divided into upper and lower levels, the area is covered by the Hutts' strict no-fighting policy and offers a rare respite from the conflict that wracks the rest of the galaxy. Rivals and sworn enemies are expected to put aside their differences here--or else be brutally handled by Hutt Cartel enforcers. Clubs, entertainment venues and high-end shopping line the arrival points from Nar Shaddaa's spaceports, and casual visitors can find everything they need at Promenade vendors. Speeders are available to many of Nar Shaddaa's districts, but by far the most popular routes lead to the Club Vertica and Star Cluster casinos. The so-called "smuggler's moon" is best known for one thing: anything can be bought here if the price is right. Nar Shaddaa orbits Hutta, homeworld of the Hutt Cartel, but exists as a power in its own right. Criminal organizations and legitimate enterprises operate side-by-side, regulated only by the Hutts' whims. Gleaming skyscrapers house corporations, casinos, technology shops, spice houses and every other type of business imaginable. Although no other world offers Nar Shaddaa's unique services, the city has a notorious murder and disappearance rate. Gangsters, pirates, slavers and worse crowd the streets, and Republic and Imperial representatives compete for influence with the local powers. Strangers should be extremely cautious.